Cahermore is a fine almost circular stone fort situated in Ballyallaban over looking the Ballyvaghan valley. The interior of the fort measures around 170 ft across and the walls are from 8ft to 9 ft thick in places. The Fort was built during the medieval period between 500 AD to 1100 AD as a defended farmstead. 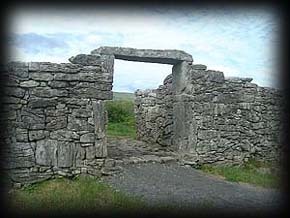 The gateway which is a mortar-built turret has a large lintel some 6 1/2 ft long and 5ft wide is not original and may have been built during the 15th century. There is a later built outer wall circling the inner fort measuring about 400ft across, the outer and inner walls were subdivided by smaller walls and these areas were most likely used as animal stockades. 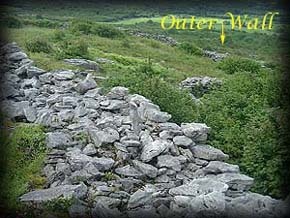 Situated: In Ballyallaban on the west side of the R480 approximately 4 kilometres south of Ballyvaghan. Discovery Map 51: 2200 0450. Last visit Aug 2002.